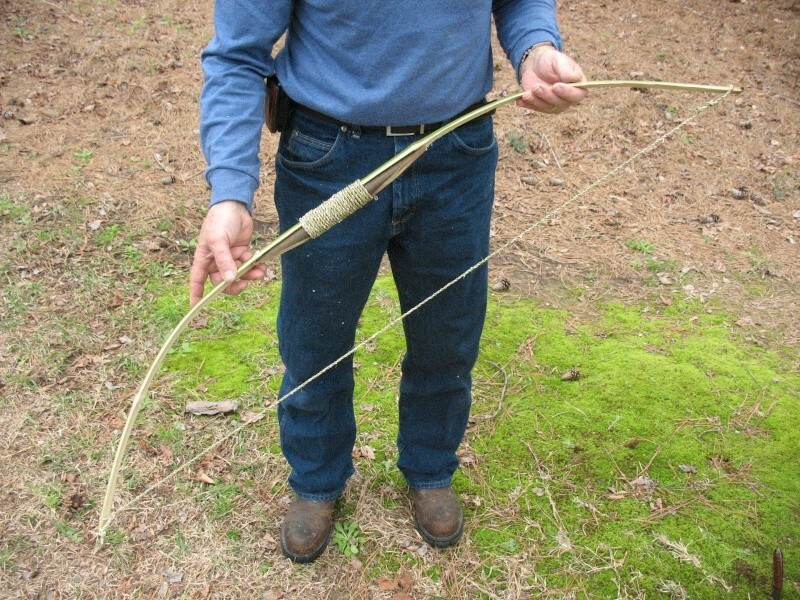 Natural bow string materials and construction. 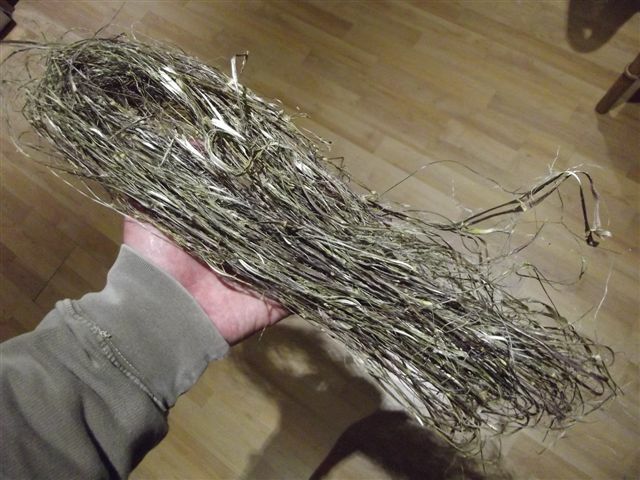 A quick look for natural materials that would be strong enough to make a bow string has thrown up many possibilities that would work, but which one is the best? It would be ideal to go "native" and use only UK indigenous plants etc. but maybe that could narrow the end results, so a little experimentation will have to happen. It is oddly laid out and the pictures and tables could well have been bigger to really see what is going on but it is a good start. Re: Natural bow string materials and construction. "Nettles produce one of the strongest of natural fibres, but processing this plant is labour intensive. It is harvested when fully grown or dying by being pulled out of the ground and allowed to age for a while before being boiled to release the plant fibres. An alternative is to soak the stalks in water, then gently pound them. Another option is to pull fibres from broken sections of stalk." It's informative reading, good stuff eh?! 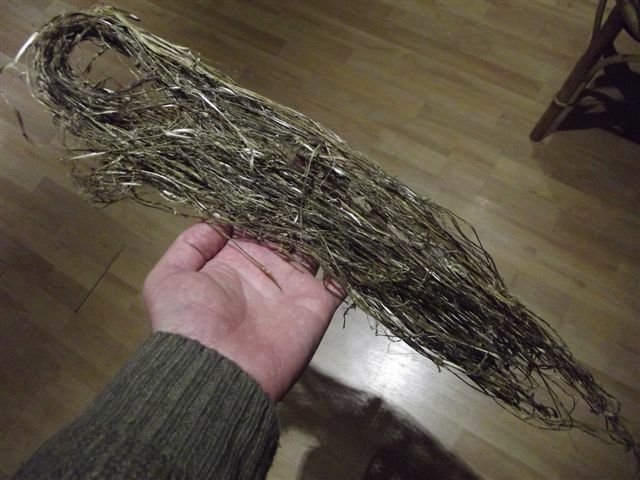 I was reading about hemp fibre production in Nepal the other day and they pull the plants out with the root on and just leave them out in the open, turning them over every day for the dew to rett both sides evenly (this applies to flax as well). For larger batches they put them in a clay mud filled pit and top up with water and leave for a few weeks untill the fibres just come away. I can't see why this shouldn't work with nettles. Ok, retting experiment. This is about 20 nettles stripped down back in the summer, the fibres have alot of woody pith still stuck to the backs so I thought a spell outside would loosen them, I tried the dew retting method of leaving them on the lawn and turning them over every day for about three days. This is the resulting bunch of fibres after drying. Woody bits still persistently clinging on and little change to report apart from a slight change of colour. I dried them out on the radiator and this made everything really brittle, the woody pith came off and broke the fibres. Aagh... Once left in the shed overnight to rehydrate slightly the pith came off without any damage. I only left them for three days as nettle fibres break down really quickly and I'm hoping for long strands to make a bowstring with, not a mass of fluff to spin with. Conclusion so far? You are better off pulling the fibres straight off the plant and not leaving loads of pith to start with! I'm not sure retting is right for string of this type. This is so basic it's genius. Turns out that 4mm sisal string works well straight from the spool on a bow pulling 25Ib, I should imagine hemp or linen string would do the same and be able to pull more poundage. It's not quite as satisfying as making it all your self though! Found this site the other day, doesn't say much about string but is interesting reading. that bow looks great - i think its ok to use off the spool string not far off natural also we dont have generations of time to work on the methods.